Samuel D. Ferguson, Chief Warrent Electrician (T)/Aviation Chief Electrician's Mate (PA), born Nov. 14, 1916, Philadelphia, PA. Education: High School, Navy Schools and various night schools. Joined USN Jan. 7, 1936, and stationed in USS West Virginia, USS Bull Finch minesweeper, advanced base aviation, ACORN (RED)2, Espiritu Santos, New Hebrides, Naval Air Technical Training Command, Jacksonville, FL. He was discharged July 3, 1946. Ferguson and his wife, Pearl, have three sons and one daughter. Their marriage from 1940-81 ended when Pearl died. He married Helen Ayres Aug. 7, 1986. There are seven grandchildren. 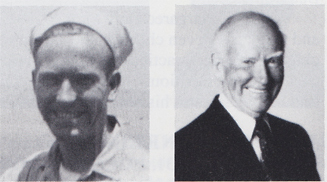 Ferguson sailed as chief electrician on research vessels and passenger cargo ships; was employed by the Univ. of Washington and Navy Civil Service; and as elevator mechanic by Sound Elevator Co. and the Univ. of Washington. His hobbies are football and baseball.